As a personality and lifestyle brand, The Lifestyle Mavenâ„¢ brings to you a trans-cultural style revolution, merging cultures through a shared appreciation for style. The Lifestyle Mavenâ„¢ is the quintessence of the new generation of multiculturalist â€“ modern, world-traveled, cosmopolitan, your inveterate metrosexual and trend-setter. 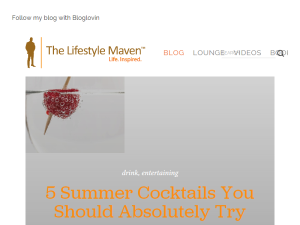 This what your The Lifestyle Mavenâ„¢ Blog Ad will look like to visitors! Of course you will want to use keywords and ad targeting to get the most out of your ad campaign! So purchase an ad space today before there all gone! If you are the owner of The Lifestyle Mavenâ„¢, or someone who enjoys this blog why not upgrade it to a Featured Listing or Permanent Listing?